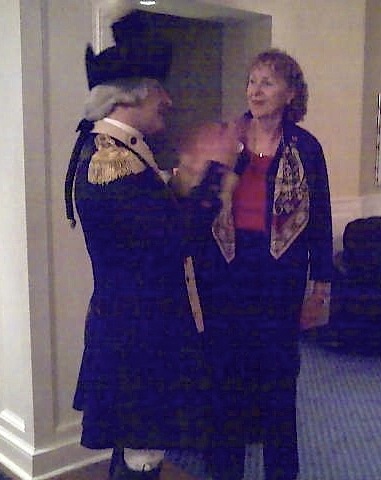 The Marquis de Lafayette converses in his native language with Author, Jini Jones Vail. C’est moi! We met in Williamsburg at a Washington-Rochambeau Revolutionary Route (W3R) Board Meeting. How lucky am I for a lowly author to meet the world renown Marquis de Lafayette! I told him how I fell in love with his home, Chavaniac, and that I now have a bedchamber just like his when he was a baby. He must have thought I was a crazy, dazed American! Mais oui! Il a raison.